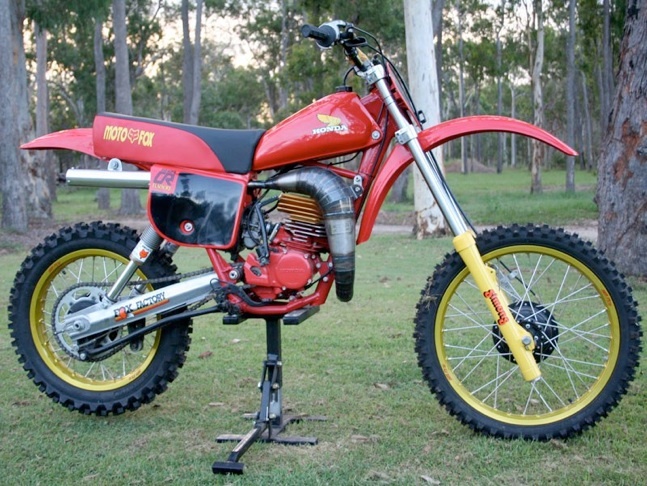 I am submitting my CR125R for bike of the month. This bike started for me as an ebay win, partly restored and pretty well stock. It had late model black guards on it which were thrown over my right shoulder, as well as a CR250R seat and tank which did not fit (I kept them!). I sourced all of the trick parts, including the Thor swingarm which was to suit a CR250R. I had it modified to fit the CR125R. I then used a CR250R rear wheel. The pipe and mufler are GMC items made here in Oz. This particular model has always been a fav of mine because when I was 12 my neighbour owned one and I thought it was the schizzzit.